"In this magisterial work Nicholas Hagger unites the rational and intuitive strands of Western philosophy in the light of the latest findings from physics, cosmology, biology, ecology and psychology. His in-depth exposition of these sciences and their philosophical implications is breathtaking in scope and detail and fully justifies his declaration of a Metaphysical Revolution, which also has profound consequences for our understanding of world affairs. This is one of the most important philosophical books to appear since Whitehead’s Process and Reality eighty years ago and deserves the widest possible readership. A stupendous achievement." This book is Nicholas Hagger’s main work of philosophy. It develops the thinking in his earlier philosophical works into a comprehensive philosophy of the universe. The book reconnects philosophy with the universe/Nature and will present the philosophy of Universalism as arising from the orderly universe of cosmology, physics, biology and metaphysical philosophy. Universalist thinking has applications in the environmental movement, political world government, religion, history and culture. The book restates, and redefines, the metaphysical principle in our time as an experienceable ordering reality and as a system of ideas. 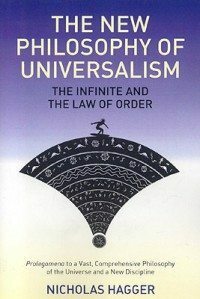 It states the philosophy of Universalism in an accessible form. It is a book for the general reader and seeks to integrate all the disciplines – history, philosophy, religion, literature, science and the study of consciousness – into a single vision. This book gives a comprehensive and complete statement of Nicholas Hagger’s philosophy of Universalism. The New Philosophy of Universalism challenges the Dawkins-neoDarwinist view of a random universe in favour of an ordered bio-friendly one. At the origin of Western civilization, philosophy reflected the One universe and man’s position in it. In the 20th century, philosophy preferred to focus on logic and language and has become increasingly irrelevant. Universalism takes philosophy back to its original aim: focus on the universe – the universe known to contemporary cosmologists, astrophysicists, physicists, biologists and geologists, who identify systems of order as well as randomness. A systematic philosophy o the expanding universe, Nature and man, Universalism identifies a Law of Order that counterbalances a Law of Randomness and offers a new philosophy that has global applications. Excitingly, it reconnects philosophy to Nature and the thinking of the pre-Socratic Greeks and reunifies the universe and the scientific disciplines so philosophy can once again consider the whole of reality. Nicholas Hagger’s books reveal truths that have been hidden. His philosophical Universalism brings a new approach to philosophy.